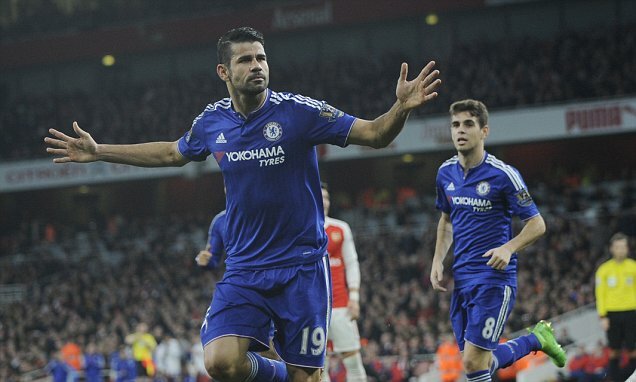 Ex-Arsenal brands Diego Costa a "serial cheat" but I bet he would love to have him in the Arsenal side! It was interesting to read the fall out from Arsenal's defeat to Chelsea last Sunday. In particular the views of ex-Arsenal Chairman Peter Hill-Wood who described him as a "serial cheat". How many Arsenal fans would love to see him play for their side? Diego Costa receives plenty of stick and attention because of the way he plays. He fires himself up and plays on the edge and forces his direct opponents to try and deal with him. If they are not going to take the fight to him or to give it back then half the battle is lost. In the two games against Arsenal, there has been two moments that have resulted in an Arsenal player being sent off. The first at Stamford Bridge after a tangle between Costa and Laurent Koscielny ended up with Gabriel getting involved. Costa received a retrospective punishment for lashing out at the French defender which is fair enough but Gabriel was sent off at the time because Costa got inside his head and he reacted by kicking him. This was later rescinded but he did receive a ban based on his reaction to being sent off. The second was on Sunday where for some reason Per Mertesacker put himself into a position that gave the Referee no choice. As I stated in my match report, Mertesacker should have been punished for the intent alone if there was no contact. In addition, what was he doing looking over at the Linesman in the distance moments before he tried to win the ball? As to Costa's reaction? Are you telling me that in a match of that magnitude that Olivier Giroud, Mesut Ozil or Alexis Sanchez would not have done the same thing? Of course they would have and I would have expected the same outcome if I am honest! "He is a serial cheat and he gets away with it. I think he deliberately ran in front of Mertesacker, who hardly touched him. Yet Costa rolls around as if his legs have been cut off. Once the red card's been shown, he's suddenly perfectly all right again. That's because there's absolutely nothing wrong with him. There certainly wasn't soon after when he scored that goal. Personally I think the referee should have sent him off for diving. It's very annoying because to me it is blatant." In my opinion and I am sure it's not a biased opinion here, is that I believe it's clever from Costa. He realises that he has caught out the defender and then takes advantage by putting him in a difficult position by cutting across his run. All strikers do it or are inclined to do it because it almost forces the defender to back away from the challenge or get involved in some sort of tangle which could result in punishment. That's not being a cheat it's just taking advantage. As for Diego Costa rolling around the pitch as though his legs have been cut off? Are you sure it's just him that does it? Isn't instances such as this rife throughout the game? The fact of the matter is that Arsenal were toothless against us as soon as they took Olivier Giroud off. Now, if they had Diego Costa playing for them it would be a different story. Anyone who has Costa leading their attack backs him 100% and loves the way he plays. Just look at him of late. He has been asked by Guus Hiddink to play the width of the penalty box to purely concentrate on scoring goals and has six in six games. There is no over the top aggression to his game but controlled aggression which is what everyone wants to see. Diego Costa is no serial cheat - he's excellent at getting inside the head of his opponents and taking advantage of their weaknesses. How many supporters would love to see Costa in their team doing the same?